Make the most out of a small garden space with this striking modular wall planter kit. Each kit comes with 12 wall plant pots featuring 3 pockets each, giving you a total of 36 pockets to grow your desired plants. Combine a few or all of these wall garden pots to create a vertical garden suitable for your area. It also comes with a 9 feet dripping hose which automatically waters the plants by opening the connected tap. With the automatic dripping system, you'll find it easier to make sure your plants are hydrated but not over-watered. Our garden wall pockets is deal for small apartments, homes with small yards, schools or offices. This eye-catching wall mount planter features an efficient automatic watering system. The 9-foot hose connects to any American standard tap and waters the 6 top most pockets at once, draining any excess water down towards the succeeding layers. Each of our self watering planter boxes is subdivided into 3 pockets. Plant different kinds of plants in different pockets and be able to grow your own choice of perennials, succulents, herbs or edible plants. 3 POCKET WALL MOUNTED PLANT POT- Each hanging wall planter has 3 pockets to give you room to grow different plants in a small space. The size of each pocket provides adequate room for your plants without wasting any precious space in a small apartment or a limited outdoor area. Grow a variety of herbs, perennials, succulents, houseplants or vegetables in just a single area at home. 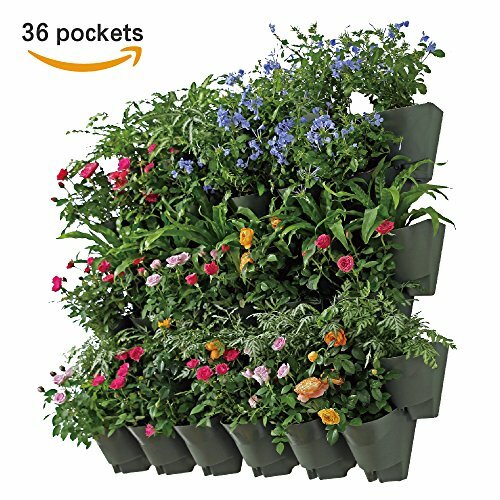 INCLUDES 12 MODULAR WALL PLANTERS- We've included 12 pots within our wall mounted hanging planter for you to create layers of potted plants for your vertical garden. Use a few wall hanging planter in one area or use them all. You can even add more layers to your vertical garden by purchasing additional compatible vertical garden pots. SUITABLE FOR INDOOR AND OUTDOOR USE - Our wall flower pots are crafted from a durable propene polymer material, which makes them suitable for either indoor or outdoor use. These are also lightweight at only 1.6 lbs so you can easily mount it on your walls, balconies, or railings without the fear of them falling down. They can easily be secured in place with regular screws.